The interactive exhibit, Secret Spaces, at the Burchfield Penney Art Center offers visitors the chance to revel in a few of the whimsical joys of childhood—building forts and sharing secrets. Using blankets and sheets draped across beds and other pieces of furniture throughout the exhibit in the Useum studio, adults and children alike can build a castle, a spaceship, or just a hideout. 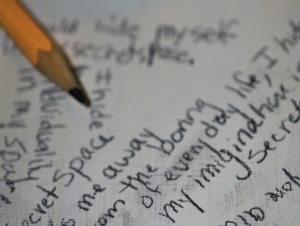 Visitors also are invited to share their own secret spaces, by using provided pencils to write on the white furniture and other surfaces included in the exhibit. Since Secret Spaces opened May 12, visitors have scribbled myriad messages throughout the room, including, “My secret space is in a tree,” “My secret space is in my imagination,” and “Don’t forget your childhood.” The exhibit runs through September 30. 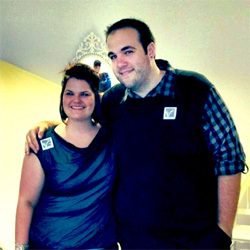 Nick Napierala, 24, and Kari Achatz, 27, the artists who created Secret Spaces, graduated in December 2011 from Buffalo State’s art education graduate program. Achatz teaches art at Queen of Heaven in West Seneca. Napierala teaches art to kindergartners and first-graders at Smallwood Elementary School in Amherst. Artistic collaborators for years, Napierala and Achatz met at Iroquois High School and studied art education as undergraduates. Napierala recalled with a laugh that Achatz called him a few years ago, and told him it was time for graduate school. So they both enrolled in the Buffalo State program. They took courses with Kathy Shiroki, curator of museum learning and community engagement for the Burchfield Penney and Buffalo State instructor of museum studies. When the Burchfield Penney Board of Directors asked Shiroki to reach out to graduate art students for possible creation of a Useum exhibit, Shiroki knew Napierala and Achatz would be perfect. Secret Spaces marks the first artistic collaboration in the Useum and the first by art educators. With only a modest budget to work with, Napierala and Achatz had to be creative. They picked up furniture from Amvets Thrift Store, their own homes, and even castoffs from the side of the road. They also put out a call to Facebook friends and family to donate pieces to the exhibit, including a tea pitcher, a tiny rocking horse, and a child’s bed. They blanketed every piece with five coats of white paint providing the room with a dream-like quality. As educators, Napierala said having a literacy connection was important. “We knew we wanted to bring writing into the room,” Napierala said. Mostly, they want the exhibit to promote a sense of fun and connectivity between children and the adults in their lives. They recalled one night where three families who previously did not know one another worked together to build an enormous fort. They also want participants of all ages to use the space to unleash their own artistic expression. Napierala and Achatz will be at the exhibit, Friday, July 13, from 4:00 to 8:00 p.m. as part of the Burchfield Penney's M&T Second Friday events. The event is free and open to the public.